Soap Opera Digest Magazine May 21, 1981. 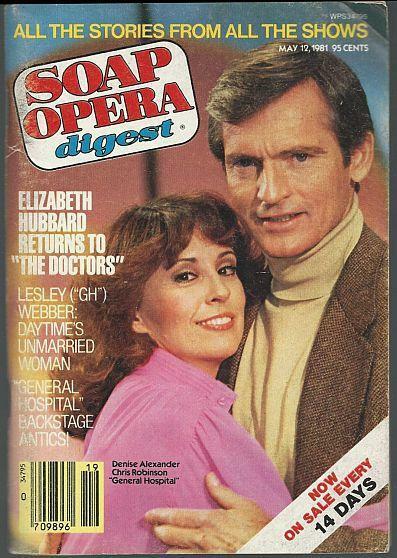 Denise Alexander and Chris Robinson General Hospital on the Cover. Articles inside include Backstage at General Hospital, Laura Malone Fan Club party, Denise Alexander, Randy Hamilton, Elizabeth Hubbard and more. Filled with Photographs of your favorite Soap stars and vintage advertising. Magazine is in good condition, wear at edges and on cover. Items Similar To "Soap Opera Digest May 12, 1981 Leslie and Rick GH Cover/Elizabeth..."